View our Perfect & Complete diamond rings. Nothing compares to the beauty of a genuine diamond, but in the last decade or so, fake diamond rings have become increasingly popular -- and in extreme cases they might be something that you should consider adding to your own jewelry repertoire. You may be asking yourself, "Now why would I ever want a fake diamond ring? I only want the best!" But the fact is that fake diamond rings do serve a useful purpose, and can come in handy in a number of situations. You may be surprised to learn that you can afford a real diamond ring. If you visit retail jewelry stores you can be shocked at the prices of their diamond engagement rings. With true internet pricing, Novori can bring the price of a real diamond ring down to what you would pay for a fake diamond ring. Just check out these Perfect and Complete Diamond Rings which include the setting made of gold and the genuine real certified diamond for the rings center stone. With prices like these you won't have to settle for fake diamond rings. As much as we all wish we could afford the real diamond ring of our dreams, that isn't always possible; and that's where fake diamond rings can help. It goes without saying that fake diamond rings are somewhat less expensive than real ones. They also offer an excellent option for high-quality costume jewelry in those situations where you don't want to risk the real item. Wealthy ladies have been wearing fake diamond rings for years in everyday situations. Generally, these are cunning replicas that mimic the appearance of their real diamond rings, which are locked safely away. The good stuff only comes out during special occasions; otherwise it's the fake diamond rings, necklaces, and brooches, and no one's the wise. Until the 1930s, most costume jewels were made of paste, glass, or low-value clear gemstones like quartz. Some old-style fake diamond rings, especially during the Art Nouveau era, did their best to look ritzy by offering fancier settings, since their stones obviously couldn't pass close inspection. Today, however, jewelers can craft such high quality fake diamond rings that they can easily pass for the real thing. While no stone in a fake diamond ring can quite match the gemstone it emulates, some come so close that no one would be able to tell the difference without a jeweler's loupe and years of schooling. These days, the famous cubic zirconium and its lesser-known counterpart, moissanite, are the primary materials used to simulate the diamonds in fake diamond rings. Cubic zirconium (or CZ, as it's called) has the longest pedigree for fake diamond ring use: it derives from a crystalline element called zirconium, and was originally developed as a heat-resistant material for use in industrial process. Given its sparkly and very hard nature, it was only natural that jewelers started looking at CZ with an eye toward using it in fake diamond rings. Sadly, those realistic fake diamond rings were decades away at that point. It was only in the 1970s that shrewd Soviet scientists were able to produce CZ worthy of being set in fake diamond rings; the first ones hit the market in the west in 1976 -- ironic, when you consider that Russia produces some of the finest natural diamonds in the world. Moissanite is otherwise known as the chemical silicon carbide. Known since 1894, it has only been used for fake diamond rings since 1998. Interestingly, moissanite makes even better fake diamonds than CZ, so a nice fake diamond ring with a moissanite gem will likely cost more than a fake diamond ring with a CZ stone of the same size. 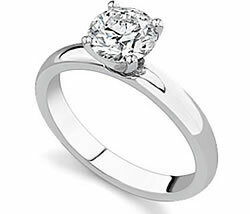 Moissanite is a better choice over CZ as it will wear better and last longer. At Novori Jewelry we are confident that we can find you a real diamond ring at a price that will rival that of a fake diamond ring. Start here for Perfect and Complete Diamond Rings which include the real, natural certified diamond with a gold setting, and then let us help you find just the right one. You can reach us toll free at 1-877-877-4141. We are here to help. CZ Engagement Rings – As Good as the Real Thing?